QI read Petlife and own two rats, two hamsters, and one bird. My name is Diana Jaroszewska. I am 12 years old, love animals, and want to be a veterinarian. But as I was reading books about rats like I usually do, I found out my rat, named Ratty Rat, has red extractions from her eyes. Please can you give me information and advice? I tried going to the vet but the medicine doesn’t work. Ratty rat is a beautiful fancy rat 1 year old and had 12 beautiful rat babies. I cared for them and they turned out so healthy. My other rat’s name is Rapuod and he is the father and licks me. My rats are so smart. Did you know they come to me when I call their name? I read that rats are as smart as dogs. My hamsters are more nervous and bite me. And my bird just sings. So rats, to me, are such good pets. I clean the cages by myself, feed them, and let them run around the apartment. So, thank you for the time, and please give me advice on the red extraction from the eyes. This rat shows the porphyrin staining around one eye. AThe red you are seeing coming from your rat’s eyes is called porphyrin, which is an iron-rich pigment that comes from the Hardarian gland behind the eye. Their tears have a red color to them, unlike yours that are clear. Usually you won’t see any sign of this when the rats are healthy. When they get sick, stressed, or have an injury to the eye, then you will see the red discharge. It is also common to see red around the nose of the rat when the eyes are showing problems. If it is coming from only one eye, or lasts longer than a few days, then it usually means an injury or infection and a trip to the veterinarian is needed. 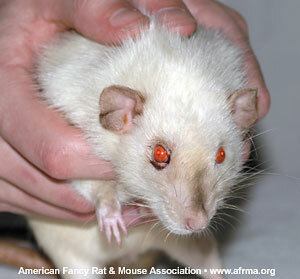 Your vet can take a look at your rat’s eyes and determine the best possible treatment for her. One important thing with treating a rat with medications, is to make sure you do the treatment the required amount of time. Since you say the medicine is not working, I would suggest another trip to the vet for an additional exam and possibly new medications.